You may be discovering what five million annual visitors already know: The Texas Hill Country Wineries are spectacular and fun! From Austin to Fredricksburg and everywhere in between, there are over 50 wineries scattered throughout the rolling hills and valleys of this region. Each area has its own “wine trail” so you can visit several wineries in one day. Take your map, rent a chauferred limo, small bus or van and enjoy the day. No need to worry about driving…Just sit back, sip a glass of wine and take in the spectacular scenery this area has to offer. 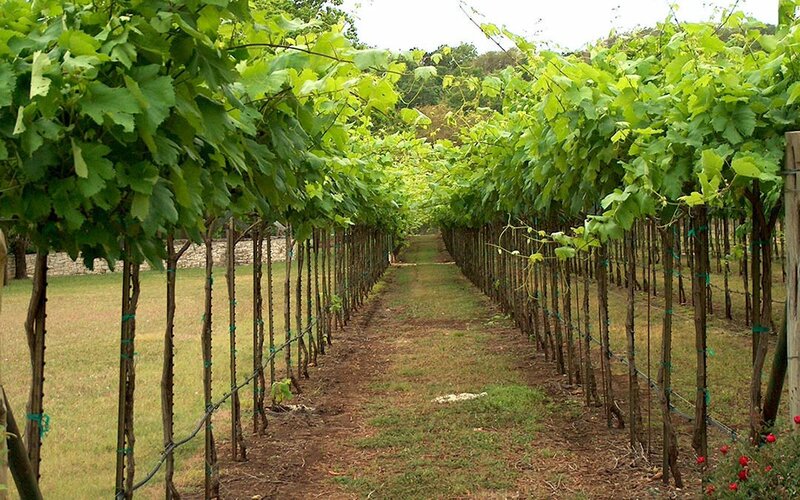 There are so many wineries in the area but one of my favorite trails is a half-day wine tour called the “Driftwood Trail” in Driftwood, Texas. You are only 45 minutes from the New Braunfels area and 10 minutes from Austin. 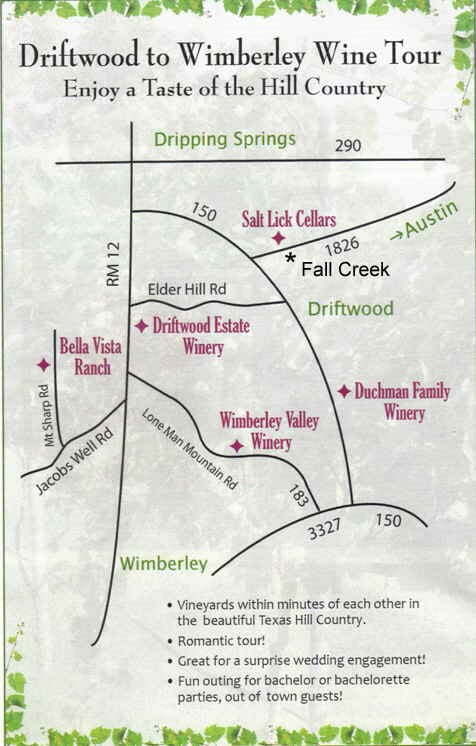 There are 6 wineries listed on the tour…Driftwood Estate, Fall Creek, Duchman Family, Bella Vista Ranch, Wimberley Valley and Salt Lick Cellars. See the map below to organize your trip. One of my favorite wineries in this group is the Driftwood Estate Winery. From the bluff of this property, you can see miles and miles of green, rolling hills and valleys. Sit under an old oak tree, feel the cool breeze on your face and take in the views while sipping some of the best wine selections in Texas. The Duchman Family Winery is also a favorite among visitors. They have a evolving selection of fine Italian wines ranging from obscure varietals crafted by little known boutique wineries to their own Mandola wines, created in the original Italian tradition. Save this winery for the end of the day because only steps away is the Trattoria Lisina Italian Restaurant. Forty- foot ceilings with old world décor will make you think you have been transported to Tuscany. Savor the Italian regional cuisine of this charming restaurant, known for its handmade pasta, house cured meats and fresh local produce. Whether you are looking for a romantic getaway, a girls night out or an enjoyable outdoor excursion, the Driftwood Trail will not disappoint!